Indigo Indian Asian Restaurant offers a full restaurant buy-out, with outdoor seating for up to 200 guests, indoor seating for up to 80 guests and cocktails for up to 300 guests. The venue is ideal for weddings, engagements, birthdays, anniversaries, corporate functions, product launches, small parties and private dining. 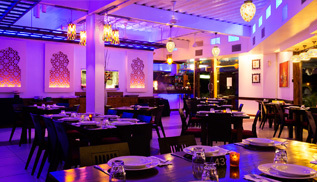 Indigo Indian Asian Restaurant is a flexible space that can cater to all your needs. Outdoor area right on the water!